HSE researchers were in a fast food outlet observing activities in connection with slips and trips. A customer bought food and drink but spilled some of their coffee on the way to sit down. The spillage was small, about the size of a fifty pence piece. The fast food company was aware of the risk of slipping from liquids or food spilled on their smooth floors and, almost immediately, a member of staff came to deal with the problem. They mopped up the spillage (and also the surrounding area because it looked dirty), squeezed out the mop and went over the whole area again, leaving an area of approximately 2 square metres 'mop dry'. The researchers took measurements on the 'mop dry' area using pendulum and surface micro roughness techniques, and also timed how long it took to dry completely. The 2 square metres of mopped floor, now almost indistinguishable in appearance from the rest of the floor, took approximately 7 minutes to dry and measurements showed that the area was extremely slippery during that time. 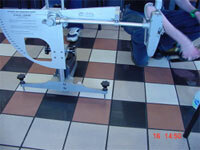 Research has shown that many slips are caused by a sudden change in floor surface characteristics. In this case, for the 7 minutes until the floor dried completely, it would be difficult for customers and staff to realise they were walking from a safe to an unsafe surface. The company, who had a good awareness of slips and trips risks and an efficient system for identifying spillages, had, in fact, increased the risk of slipping because of the method of cleaning used in this instance. Simply cleaning up this spillage, and drying the small area of floor with a paper towel would have been far better. The fast food company are considering a change to their spillage and general cleaning procedures.